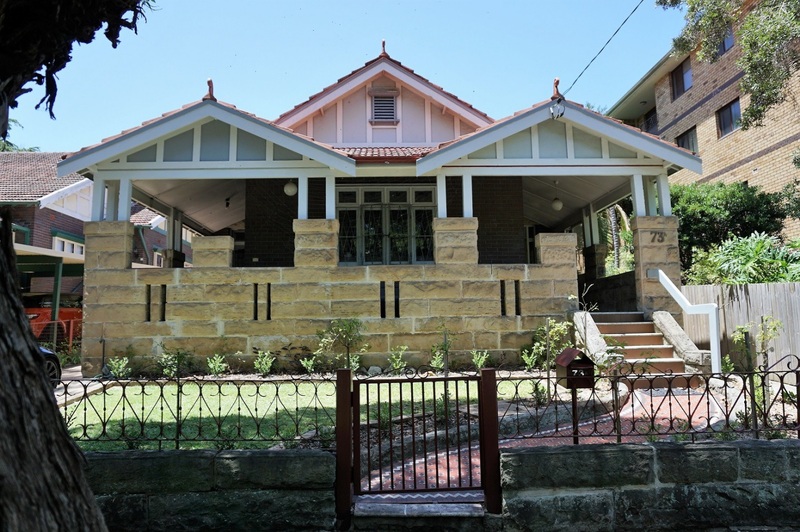 Its easy to take this 1920 bungalow at face-value when you walk down the street; it's a neat, old house that looks like it 'belongs' in an inner-west Sydney street. While the bungalow is special in its own right, when we dug deeper into the history of the site and its surrounds, we turned up the ghost of the grand residence Toddington, and discovered that this address at The Boulevarde, Dulwich Hill had been home to some pretty big personailites. Local land owners Charles & Frances Nelson each picked up a couple of blocks of the Lewisham Estate, and commissioned the construction of Toddington. They moved in around 1877. When the Nelsons moved on in 1883, Toddington became home to 'Honest' John Tait, highly successful racehorse breeder and trainer - the first in Australia to make a viable commercial buisness out of horse racing. He was carefully selected his horses, and put every effort into their care so they always ran in top condition. He was rewarded for his dedication; 4 Melbourne Cups amoung an impressively long list of wins at high-stake race meets. When he retired, Tait's horses had reportedly won over 30,000 pounds ($3 million AUD today) across his 36 year racing career. In 1891, Toddington was sold to Robert Percy Johnston and Eliza Chrisitina Johnston, who were the married first-cousin grandchildren of Major George Johnston of Annandale, the leader of the 1808 Rum Rebellion and one-time temporary head of government of the colony. All families have their challenges, and the Johnstons were no exception! Following his father George’s death in 1823, Commander Robert Johnston (Robert Percy's father), forcibly took over the administration of the Annandale estate by taking his famous convict mother, Esther Abrahams to court and had her declared insane to prevent her from selling the property. Esther then went to live with her youngest son, David (Eliza’s father) at Georges Hall, where she stayed until her death in 1846. It would have made for 'interesting' conversation at family functions, but it did not stop Robert and Eliza from living happily-ever-after at Toddington with their nine children. Toddington and its generous parcel of land was sold in 1916 to local builder, William Mitchell. He leased Toddington house out and it became a private hospital. So began the next chapter of life at the property. The deep, former front garden of Toddington is where William Mitchell built his Californian-style bungalow at no.73A (pictured). He left behind his builders mark; '1920' is carved into one of the sandstone blocks on the verandah. The neighbouring bungalow at no. 73 was built around the same time. Toddington Private Hospital was eventually demolished, replaced by 3 storey red-brick apartment blocks facing Canterbury Road. Luckily, snippets of Toddington's history have been captured in survery plans, house sale advertisements, funeral notices, newspaper articles and a very handy photograph. All just waiting to be assembled into a whole. The beauty about history is that it is truly a 'voyage of discovery'; we were constantly surprised and delighted not only by what we found, but the by search itself - which required some tricky detective work at times! We really enjoyed being invited into this lovely home to help tell its story. What fantastic stories are waiting to be discovered in your street?